DP World aims to cultivate a dynamic and inspiring work environment as a key driver of its success. Although our operations are geographically diverse, and each of our terminals in the subcontinent operates under License Agreements with individual Port Authorities, the values of teamwork, commitment, and leadership are shared across the region. DP WORLD NHAVA SHEVA, WHERE SAFETY IS THE WAY OF LIFE. Terminal is also compliant with the International Ship and Port Security (ISPS) Code. The Terminal had laid down Safety rules/regulations, Standard operating procedures & all its employees are committed towards the same. Also the terminal is compliant with all the safety standards laid down by corporate. These standards are to manage the risk in the terminal & at vessel side. 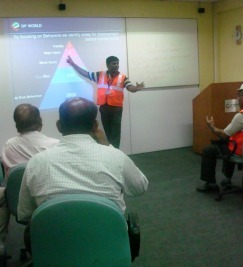 At DP WORLD NHAVA SHEVA Safety is everybody’s responsibility. We have a Total Safety Culture where all Management/non Management and contracted staff are involved in active Safety Intervention where they identify the unsafe act/condition & correct the same in positive manner. Employees & contractor feel proud to take terminal safety as part of the day to day operation. We prefer No blame culture & do take mistakes as learning opportunities. Also the information is shared amongst other terminals as a learning lesson.